We were sad to hear of the recent death of Sebastian Page. The founder of Wellington's Thorndon Fine Prints had let us know that he was selling the business due to ill-health a few months ago. In my role as the catalogue manager for NZ Fine Prints I have been purchasing from Thorndon from the time I first graduated from Otago and joined our family's business. Seb was a great person to deal with, always packaging the prints with care and getting them to us on time. In later years I would always get a phone call letting me know when he and Marcia (of Page Blackie Gallery) were heading off on their winter holiday so I could make sure we had enough of the ever popular Thorndon "Cook's Map of NZ" on hand until their return. Oh how envious I was as we headed into another Christchurch winter! Our gallery has now purchased the remaining stock of fine art prints, maps and charts published by Thorndon Fine Prints. Alongside all the titles we have promoted previously (like this map of the Pacific by Zatta) there are some additional prints that we now have for sale for the first time - in a couple of cases these are duplicates of images published previously by Avon Fine Prints such as the Cassini map based on Captain Cook's charts that we hadn't seen the need to double up on previously - but there are also some really well priced smaller prints from Buller's "Birds of NZ" and a couple of fine NZ botanical prints such as this print of Pohutukawa (historically interesting as it has an earlier spelling of Pohutukawa and is titled Metrosideros Tomentosa rather than the modern nomenclature of Metrosideros Excelsa) by 19th century NZ botancial artist Sarah Featon. The story of Thorndon Fine Prints was detailed in some of the brochures that we received with the prints and worth recounting to make sure Seb Page's contribution to art print publishing in NZ is long remembered. 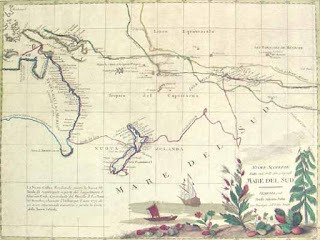 "In 1990, inspired by an awakening of interest in historical New Zealand, and particularly in the era of exploration and discovery, Thorndon Fine Prints issued two fine replicas of the most collectable of antique New Zealand maps, Cook's Chart of New Zealand, originally published in 1772, and the map of colonial settlement published in 1845. Subsequently the range has been extended to include the most popular maps and prints relating to New Zealand and Pacific history, including some of the most decorative images of discovery, settlement and natural history, by the acclaimed artists of the time. All reproductions are printed on the finest quality papers and presented with well-researched documentation." 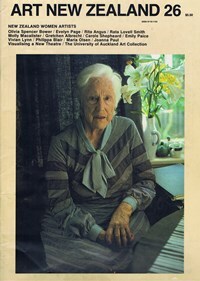 cover of "Art New Zealand"
vibrant paintings of nudes and still-life are among the most memorable images in New Zealand art of the twentieth century. Thorndon Fine Prints began their publishing relationship with the Evelyn Page Estate in 2002 with their limited edition print release "Why Go To the Riveria? - Oriental Bay, Wellington". The unprecedented success of this inaugural publication led to the inclusion of two more images by Evelyn Page in the Thorndon Fine Prints portfolio the following year. Exclusive to Thorndon Fine Prints they were reproduced on the finest quality paper using UV resistant inks. We are delighted to stock the three prints exclusively available from Thorndon alongside the Christchurch Art Gallery published print of Summer Morn (their edition of the every popular "Pohutukawa Rina" is unfortunately currently out of print while the gallery is closed).